Carriden House was originally a late 16th century stone unadorned tower house, founded by the Abercrombies. Standing at the eastern conclusion of the 2nd century Antonine Wall, this site has been continually occupied since the Roman fort of Veluniate was built. With a vaulted basement and a steeply pitched stone roof, Sir John Hamilton of Letterick rebuilt the eastern five storey L-plan tower house, in 1602. Never of any great strength, in 1682 Alexander Mylne added the three storey western block and mid 18th century landscape gardening has lifted the ground level on three sides of the house. 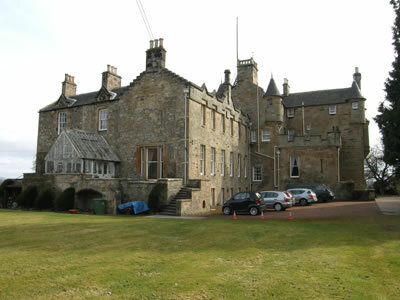 Considerably remodelled and enlarged in the 19th century, the house is now a large Scottish baronial mansion, with gun-loops, large windows and small turrets corbelled out at the angles. 2 miles east is Blackness Castle and 3 miles south-west is Linlithgow Palace. Carriden House is located north-east of Muirhouses, off Carriden Brae. 17 miles west of Edinburgh, on the A90-A904. The site is an authentic Scottish family run guest house and access is restricted to guests with reservations for an overnight stay or a wedding ceremony, check website for details. From the A933, take the 3rd turning on right at Stone Cottage, follow this farm track until you see the sign for Carriden House on the gate. There is a car park.